Welcome back to our series about real life on the road! Several people have asked recently about meals on the road: how we make them, what our kitchen set-up is like, what our limitations are with meal prep while living in an RV, and simply what we eat. We’ll tackle the first few questions here and write a separate post about our typical meals on the road. Enjoy and stay tuned! The other day I was talking to a friend and colleague about some “real-world-reentry-ideas” (yes, we are starting to consider what happens when we get back to NC in December) and she mentioned that she really likes our blog posts about our everyday life on the road. So with this in mind let’s talk cooking. If it were up to me we’d subsist on a steady diet of Panda Express, Krispy Kreme Doughnuts, and Five Guys Burgers & Fries. But it isn’t up to me, we are on a tight budget, and I would like to live to see my 42nd birthday so we tend to make the vast majority of our own meals. Our refrigerator/freezer is about 1/3 the size of a normal household refrigerator which means we can’t go too crazy grocery shopping. But if we are efficient in our packing of said refrigerator we can fit a lot in there. Think of all the empty space in your home refer, subtract that out and you’ve got something about the size of ours. It runs off electricity when we are plugged into shore power at a “fancy” campground (a rarity for us) and propane when we are not plugged in. Don’t ask me how it works; it has something to do with boiling ammonia. It’s a simple three burner stove that runs off our propane supply. It basically has three settings (1) the sun, (2) slightly less hot than the sun, and (3) off. It works well if you want things hot in a hurry. Not as well if you want to simmer something. There is no simmer; just various states of boil. That said, we’ve learned our stove and have become pretty good at cooking on it. It’s about the size of an easy bake oven but doesn’t work quite as well. It too is powered by propane. It doesn’t heat evenly and its temperature control is very much a game of culinary roulette. We did add a pizza stone above the heating element that has helped a great deal. We don’t really bake with it but we do use it from time-to-time to “prepare” frozen or cold items such as a take-and-bake-cookies or frozen biscuits. It is also a bit of a propane hog so it just isn’t very efficient to make small portions. As an aside, on cold mornings it is nice to leave the oven door open and let the pizza stone radiate heat for 30 minutes or so as you enjoy a hot biscuit (once the propane is turned off, obviously). For the most part our oven gets used for bakeware and dishware storage. We have one! But unless we are plugged into shore power (again, rarely) we can’t use it. So, it typically serves as a very nice extra cabinet. When we are plugged in, it works quite well. We really like our sink. It’s a double-basin model with big, deep bowls. It also has a tall, pull-down faucet. This combination makes preparing meals and washing dishes quick and easy. Perhaps the best purchase we made before leaving home was our Char-Broil Grill2Go Tru Infrared grill. We generally use the grill several times a week. It fits neatly into our “basement” (the storage space under our RV) and runs off small, 16oz propane bottles (think small green cylinders you can pick up at any big box store). I’ve owned my fair share of grills and this is by far my favorite. It’s easy to cook on, clean, and works extraordinarily well. Best of all, it’s small enough to go just about anywhere. Simply put, we love this thing! We use our individual-size blender for smoothies somewhat frequently. We can use the inverter (i.e. battery power) to run this just about anytime we want. Our toaster requires shore power, as does the crock pot we still haven’t used and should have left at home. Jessie’s tiny coffee maker that also requires shore power has all but been replaced by her Melitta pour-over, meaning that the coffee maker should have been left at home as well. You can imagine that when we pay for shore power we go a little bit crazy using the toaster and microwave. It’s a bit like Christmas and we feel like kings as we eat toast (TOAST!) and reheat leftover food in the microwave (after we empty its contents). For an RV/Travel Trailer of our size (roughly 25 feet), we have a ton of cabinet and counter space. Most RVs our size are designed for weekenders and vacationers, and the kitchens reflect this reality in a lack of storage space. Our unit and its spacious storage can easily store 1-3 weeks of “dry” food and 1-2 weeks of fresh food and allows ample counter prep space. This was a priority for us when we were RV shopping as we knew that due to our limited budget we wouldn’t be eating out very often. For the most part we simply brought a limited supply of pots, pans, and utensils we’d been using daily since we got married five years ago, supplemented by the occasional $.75 item from a thrift store. Certainly there are times when we’ve thought “we should have brought the _________” but those are infrequent. In fact, we find ourselves saying “we should have left that at home” more frequently. For the most part we did a fantastic job bringing just enough of everything to make life in the kitchen quite functional. It took us a few weeks on the road to really learn to use our kitchen, pay attention to water and propane use, and figure out a good storage plan. We are now quite comfortable with our kitchen. In fact, all three components of the infamous “kitchen triangle” (cooktop, sink, refrigerator) are all accessible within one step. It is the most efficient kitchen we’ve ever used. I guess that’s what you get when you live in 168 sqft. We’ve just got to be sure there aren’t too many cooks in the kitchen. PS – Read our previous post in this series here; for a tour of our RV check this out; for other lessons learned visit us here; and for our story of finally figuring out our energy vampire in the fridge, click here. Welcome back to our series “Lessons Learned on the Road”! If you’re new to this series or just need a refresher, here are the basics: Each post corresponds to roughly a month of travel (or two months, as the case may be). Posts are random-ordered lists covering a range of categories and topics, some specific to RV life, some related to travel, and others simple observations and knowledge obtained along the way. We hope you enjoy our musings! You can read earlier posts in this series here, here, here, here, and here. -We’ve written before about our preference for traveling without campground reservations or an itinerary (sometimes we wake up and really don’t know where we’ll go that day or where we’ll spend the night) and the many benefits of first-come, first-served camping. Traveling without reservations or firm plans has proven to be ever-helpful while traveling in the Pacific Northwest, as we’ve had to pack up and move on a dime several times due to wildfires and smoke. Flexibility has been our friend. -If you’re going to be hauling around full or semi-full tanks with any regularity, it’s a really good idea to reinforce your tank supports under your RV. We learned this the hard way when our fresh water tank support worked its way loose while driving down a rural highway. Handyman Jason reattached it with a new bolt and then added a second piece of bent-angle steel under the fresh water tank. It seems to be doing the trick. -For several months now, we’ve been using concentrated all-purpose camp soap (‘Camp Suds’ or a similar brand) for dish detergent. It works really well and suds much less than traditional dish detergent, so we can use less water when doing dishes (I found myself using a ton of water to rinse dishes before we made the switch). However, I will note that I still use Dawn when washing our metal grilling spatula/flipper because Dawn cuts the grease faster than camp soap. I also use Dawn occasionally when we’re in a developed campground with hook-ups and a dump station because we think it helps cleanse and cut grease in our grey tank. -Weather forecasts in the Pacific Northwest are rarely accurate. It’ll be beautiful and sunny when rain was forecasted for the day and vice versa. But most of the time, you should err on the side of planning for a grey, rainy day. -Another water-saving strategy we’ve been using for a while: We often collect sink and shower water in plastic tubs/bins and repurpose the water for flushing the toilet. On occasion, if I do a fairly clean load of dishes, like washing our water bottles, I’ll even repurpose that water for mopping the floor or cleaning the shower. When we can’t repurpose all the water we collect, we’re often able to dispose of it in designated areas within campgrounds or dispersed camping areas (e.g., utility sinks, grey water drains, pit toilets). Collecting some grey water makes a huge difference when boondocking/drycamping and/or staying in a campground without a dump station; we can usually stay put without dumping our tanks for 5-7 days when we’re able to collect and repurpose or dispose of some grey water (our grey tank is 30 gallons). -Always turn off the water pump before traveling. Jason usually asks me at least three times, “Is the pump off?” before we pull out of a campground. I usually roll my eyes and say, “Yeeess, worry wart.” But no more. I’ll never roll my eyes again, as we know some full-time RVers through social media who had a bad experience recently when their pump accidently got left on during travel. -Unless you’re buying diesel, it’s illegal to pump your own gas in Oregon. It’s like New Jersey. We’re not fans of this law. -Cell phone service anywhere around Mount Rainier, including towns outside the park, is close to nonexistent, and it’s even worse with an old iPhone. -You may be more likely to see a black bear in Mount Rainier while walking on a paved path near an inn than while hiking in the backcountry. The bears know where the dumpsters are. -It’s not uncommon for price ranges on Allstays to be grossly incorrect in either direction (sometimes camping areas are free or less than advertised, and sometimes they’re more than advertised). Despite this, we still love this app and it’s our go-to for most everything related to our travels. We’ve found that it’s helpful to call campgrounds or look at specific websites to verify prices. -Salt and Straw ice cream in Portland is delicious! They have the most unique ice cream flavors, and the employees are super nice and fun even when you’re being painfully indecisive. When I told our server I’d never been before, she let me sample probably 10 different flavors. The best part? The samples are served on cold metal spoons. Bliss. -A trip to Mount St. Helens is worth it. -There are LOTS of visitor centers on the western side of Mount St. Helens: one operated by a town, another by the county, and then another that’s a Science and Learning Center. While these may be worth a quick stop, keep driving and save your time and energy for the Johnston Ridge Observatory, located closest to the mountain and at the very end of the road. It’s operated by the US Forest Service and is first-class. They offer a multitude of ranger talks frequently throughout the day, Junior Ranger programs, lots of exhibits and trails, and two movies. Don’t miss the movie on the geology and eruption of the mountain. It’s one of the best park/monument films we’ve seen all year. -When you drive down lots of lumpy, bumpy roads with your RV, it’s a good idea to periodically check the screws on your water pump. The vibration of the pump itself, plus lots of miles on the road, can cause the screws to loosen and the pump may stop working until they’re tightened up again. -Don’t skip Sunrise at Mount Rainier. Paradise is THE thing to do, and with good reason, but Sunrise is equally as good, if not better. -We should have installed a roof vent cover a long time ago. As in, before we left home. The covers cost about $20 at Walmart and take about 20 minutes to install. -Seattle sprawls for hours north to south. Seriously, hours. Expect lots of traffic, especially on a Friday and/or a Seahawks game day. -Related: Seattle Seahawks fans take their football seriously. And it seems like most people in Seattle are Seahawks fans. -It’s almost always worth it to drop the travel trailer before looking for dispersed camping on unfamiliar roads (and let’s be honest, they’re all unfamiliar roads), even if we end up paying for one night of camping in a developed campground. Scout it out first or you might end up doing some of these ridiculous things. 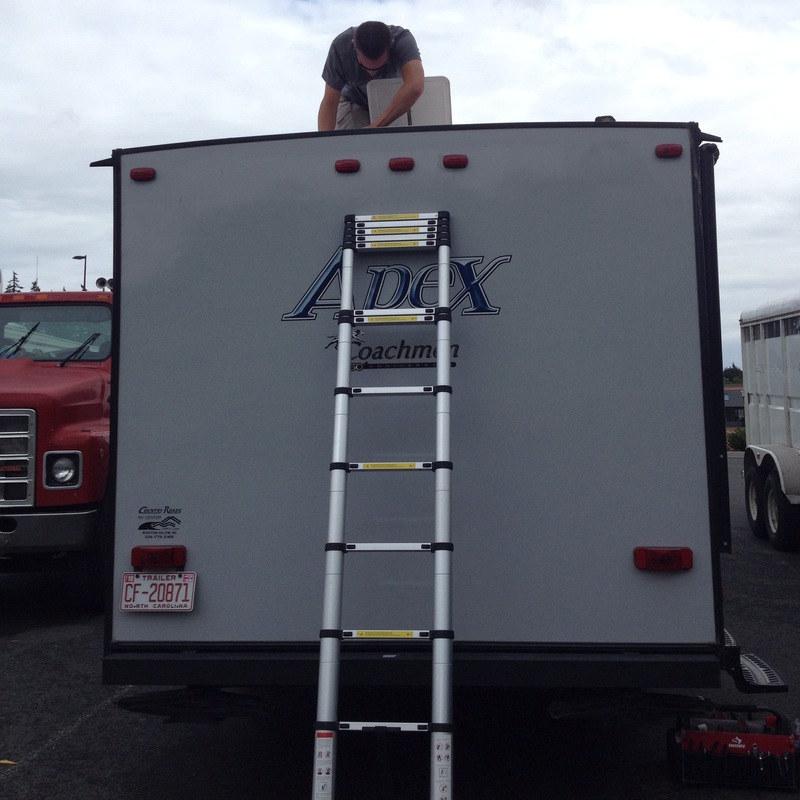 -You might draw the attention of casino security if you stand on the tailgate of your truck to inspect the roof of your RV (see same ridiculous post). -Many Washington state rest areas have very nice multi-lane dump stations with potable water. Some also allow overnight parking for up to 8 hours. -There are a lot of Panda Expresses in the Pacific Northwest. This makes Jason happy. -When there are wind gusts up to 60 mph in your campground and trees are falling, it’s time to go. -Related: Trees in the PNW are so tall that you can’t tell they’re swaying in strong winds simply by looking out the window of your RV. But if you go outside and look waaay up and see only the whites of leaves and branches falling, you get a good idea pretty darn fast. -When a big storm is expected in a rural area, it’s always a good idea to fill up anything that can hold water (fresh water tank, water bottles, bathtub in a traditional house) before the storm hits. Well water pumps generally require electricity, so no power = no water. -Forks, WA is well-known for being the setting of the popular Twilight series. So well-known, in fact, that when you call Coachmen Roadside Support for a problem with your RV, the Coachmen employee may say, “Oh, you’re in Forks! Like the Twilight Forks! So cool!” Yeah, it might be cool if our RV wasn’t broken on the SIDE OF THE HIGHWAY. -The Evergreen Aviation and Space Museum in Oregon is pricey but totally worth it. Stay until the last hour of the day, and once the families have left, go play in the kid’s area. -Don’t try to pronounce anything in the WA peninsula. You will get it wrong. -Sunsets over the Strait of Juan de Fuca in the WA peninsula are some of the very best we’ve seen this year. -Don’t skip the northern Oregon coast while in the PNW. -If you end up eating at the highly recommended Pelican Pub and Brewery in Pacific City, OR, don’t skip dessert. Order the Caramel Carrot Cake; it comes with a root beer caramel sauce, a caramel cream cheese frosting, and is topped with coconut English toffee. Also, order one of their craft beers. -With enough peer pressure, swimming in Crater Lake is totally worth it despite the frigid water – it’s an unforgettable, exhilarating experience. -We’ve noticed a trend of legal marijuana stores located right next to fast food places. Coincidence? We think not. -Horses cause a ton of trail erosion, making for unpleasantly challenging mountain bike conditions. -Volcanos have shaped much of the PNW landscape. In central Oregon alone, volcanos have formed mountains, lakes (including Crater Lake, the deepest lake in the US), deserts, and lava beds, fields, caves, etc, which juxtapose old-growth forests and lush vegetation. -There is no sales tax in Oregon. This is a beautiful thing when your spouse insists on buying a new bike for his birthday. We needed propane. Like good citizens, we turned off our refrigerator (active pilot light) before pulling into the gas station where we’d buy propane. The problem here is that we forgot to turn the refrigerator back on. When we woke up the next morning we realized we’d thawed about 2.5 lbs of expensive salmon and 1 lb of grass-fed ground beef. All of this went into the refrigerator and needed to be cooked ASAP! We tried to drive through Seattle on Friday afternoon in a downpour, which also happened to be the evening of the Seahawks first preseason game (and they take their NFL football VERY seriously in this area, even preseason). After creeping along at 30mph on the interstate for way too long, we saw a casino, Wal-Mart, Cabela’s, Panera, and Home Depot within a quarter mile of one another. We decided we’d try driving through Seattle on Saturday and settled into the comfort of suburbia for yet another night of parking lot slumber. As an aside, we are surprised by how bad Pacific North Westerners seem to be at driving in the rain. We found a spot among the 50 or so RVs who would call the casino parking lot home for the night and headed into the casino looking for a cheap meal.We opened the door to the casino only to be met by a wall of cigarette smoke. Jessie turned around and walked back to the RV in the cold rain to make some soup and read her book. I soldiered on into the casino bound and determined to find a cheap meal. In many casinos this is a fairly easy task (they don’t want you to leave!) . Not this one. Not a single meal under $13 in the whole place. So I went back to the RV to have some soup and a Snicker’s bar for dinner. On Saturday morning, after waking up in the middle of the night to an overeager LP alarm, we decided enough was enough. We needed to install a roof vent cover that would allow us to leave our vent open even in bad weather or while driving. Our LP detector simply doesn’t like air that is heavy/humid or doesn’t move (and it hates Jessie’s shampoo). Most of the time you have to buy these covers at an RV dealership (expensive!) or order them online. But, we found one at our local (for the day) Wal-Mart. So while parked at Cabela’s, we took 30 minutes to climb up on the roof and install our new vent cover. Classy. Jessie walked to Panera for some coffee and wifi while I did some grocery shopping at Wal-Mart. She was ecstatic to find that she had free coffee for the month as part of the Panera rewards program. So she proceeded to drink way too much coffee and spent the day with a sour stomach. We made one more stop before looking for camping on Saturday. Trader Joe’s. Good place for grocery shopping. Terrible place for navigating a 25 ft travel trailer. So after our soggy, noisy night at the casino and getting our shopping done and roof vent installed, we left north Seattle and headed south through town. There was a seemingly strange amount of traffic for a Saturday which leads us to believe that folks here spend a lot of time driving. And the city does sprawl north and south for hours. Our goal was to find a spot to grill our fish. How about a city park? Seemed like a good idea. Enter low hanging trees and tight parking lots. We didn’t incur any damage, but we do have some new “kisses from nature” on the roof of the RV. Clearly the parks idea didn’t work, so we headed to yet another casino to park, inspect the RV for tree damage, grill our fish, and sleep/camp for the night. Apparently, standing on your truck to inspect the RV and then getting out your grill will earn you a “welcome” visit from casino security. No grilling. “You are welcome to eat at one of our restaurants and see the Elvis show”. So we left hungry. Fed up with the suburban sprawl of Seattle, we pointed the truck southeast determined to get into the national forest near Mt. Rainer, find a campground, and grill our damn fish. We drove through two overpriced campgrounds, neither of which had any availability for us anyway, and finally parked in a picnic area to grill our fish. So at about 9 pm, Jessie with a sour stomach, we both ate a hastily grilled-in-the-dark gigantic piece of salmon after spilling salmon juice all over the RV during the preparation phase of the meal. Not allowed to camp at the picnic area, we pulled out just before 10pm to find “dispersed” camping along a gravel national forest road. We just needed a semi-level 40 ft piece of dirt to park for the night. In the pitch black, we turned off the highway and onto a gravel road. After turning the RV around utilizing an 18 point turn method taught nowhere in Driver Ed., we finally got the RV parked for the night despite the fact that Jessie, “the spotter”, feared a fatal bear attack the entire time. On Sunday, we left our lovely-in-the-daylight “campsite” hoping to find camping at a campground near the Sunrise area in Mt. Rainer National Park. We made it there easily. And they had availability! And a sign that said “no trailers over 18 feet”. It would have been nice of the Park Service to put this sign on the main road BEFORE we made the turn. So we backed out and turned around. Homeless yet again. We left Mt. Rainer and headed south into yet another national forest and another overpriced campground. But we backed into site A6 and debated staying anyway. Nope. Let’s go find free camping in the national forest. So down another narrow forest road we went. Dead-end. So we backed out, uphill about a mile, turned around in what amounted to a shallow drainage ditch and headed back to site A6 eager to pay $20 not to have to be in the truck any longer. Jessie now has reoccurring dreams/nightmares about finding free dispersed camping, and Jason is sick of backing up the trailer. Clearly the more confident we feel in our travels, the more willing we are to take risks (i.e. drive down narrow gravel roads with no real idea of where we are going). These risks often mean great rewards, but sometimes they mean eating fish off a paper plate three hours later than you planned and in a location you never knew existed. Welcome back to our series “Lessons Learned on the Road”! If you’re new to this series or just need a refresher, here are the basics: Each post corresponds to roughly a month of travel. Posts are random-ordered lists covering a range of categories and topics, some specific to RV life, some related to travel, and others simple observations and knowledge obtained along the way. We hope you enjoy our musings! You can read earlier posts in this series here, here, here, and here. Visiting Yellowstone National Park during the July 4th holiday was just as terrible as one might expect in terms of crowds. Lots of people love selfie sticks. Lots of people create hazards with their selfie sticks. People are often completely unaware of hazards they create. We loath selfie sticks. If you want to see more than an area or two of Yellowstone National Park, be prepared for miles and miles of slow driving, which equates to many hours in your vehicle. When the National Park Service advertises a max RV length for campgrounds in Yellowstone National Park, they consider the entire length of your equipment combined; for us, this means the combined length of our trailer, hitch, and truck. And the park service means business at Yellowstone. At some campgrounds, the campground host will bust out a tape measure and measure your equipment from bumper-to-bumper (accuracy is up for debate) and send you away if you exceed the advertised max length even when they are multiple sites that you could undoubtedly fit into without damaging your equipment or the environment. We prefer National Park Service sites with entrance fees over those that offer free admission. We have an interagency annual pass that essentially waives all entrance fees. Many of the sites with free admission charge for parking (e.g., Mount Rushmore) or for tours that are required to see any of the site’s main attraction (e.g., Wind Cave NP) for which our annual pass provides no discount or fee waiver. It pays to read interstate billboards. Thanks to billboard ads, we found a $5/night overnight-parking “campground” with electrical hook-ups, which allowed us to use our A/C, a godsend during a South Dakota heat wave. As if shore power at that price wasn’t enough, the place also had a nice dump station with potable water. If we can’t find affordable camping with electrical hook-ups during a heat wave, the next best option, which actually may be equally as good, is to find free camping in a place that offers nature’s A/C – shade, elevation, a breeze, and a river or lake fit for wading, swimming, and/or lounging. Southwest South Dakota is a slightly strange, diverse place. The region is home to the scenic Black Hills (“Rocky Raccoon”, anyone? ), national historic sites and museums, multiple largely undeveloped national parks, monuments, memorials, grasslands and national forests, two massive mountainside carvings (Mount Rushmore and Crazy Horse), and countless tourist trap attractions. Within the space of half an hour, you can find yourself in the Badlands wilderness and then in the middle of crazy town, mega-tourist trap Wall Drug. Even this far into our trip with all of our experience and “lessons learned”, there are places and short-on-luck days when it takes hours to find basic necessities like propane, potable drinking water, and a dump station. If one of those days happens to be your five year anniversary, well then, that’s just life. One night at a decently priced KOA with full hook-ups (electric, water, and sewer) is the way to go when the water tank and water lines in the RV need to be sanitized. While there, you might as well embrace the KOA culture and enjoy an overpriced cone of soft serve ice cream on the pink flamingo-themed retired school bus turned café seating area. Badlands National Park has two campgrounds. One of them is completely free and can accommodate RVs of most any size without issue if you don’t mind some dirt road driving, potentially creative leveling, and a primitive campground with loosely defined sites. Also, the free campground is way more scenic than the developed one. Lolo National Forest is spread out into a few sections in western Montana. At least two of these sections offer camping near beautiful lakes or rivers and varied recreational opportunities, including miles of mountain bike trails. Lolo has been good to us. In Cody, WY, more people utilize Wal-Mart for overnight parking than the local, reasonably priced Buffalo Bill State Park, including people who stay in the area for multiple days and want to unhook from their RV and leave it parked unattended all day while they explore. Even a campground employee at Buffalo Bill State Park told us, “Well, if you don’t need to use the (pay) showers here, you might as well go stay at Wal-Mart. You won’t be alone; about 30 RVs will be there tonight.” She was right. The Wal-Mart in Cody is so RV-friendly that there is a sign in the parking lot with directions to the two closest RV dump stations. Thermopolis, WY is home to the world’s largest mineral hot springs, and the state park located there allows visitors to enjoy a free 20-minute soak in the indoor or outdoor soaking pool at the public bath house. Following your soak, a shower is almost mandatory, as you’ll smell like sulfur. This is no problem, as warm showers are also complimentary in the bath house locker rooms. Two things for free, including a spacious shower where water can run the whole time is right up our ally! Southern Utah isn’t the only place where we have, or where we will, see daily temperature fluctuations of roughly 50 degrees. In Utah, we saw days with lows in the 30’s and highs in the 80’s. In Montana, we’ve seen days with lows in the 40’s/50’s and highs in the 90’s/100’s. This low humidity deal takes some getting used to, but we like it! A pour-over coffee brewer is the way to go for camping (tent or RV) or for non-coffee drinkers who want to have a simple way to brew coffee for house guests that doesn’t require the storage space and clean-up of an electric coffee maker. A pour-over is essentially a funnel-like cone that sits on top of any standard coffee mug. All you have to do is place a paper filter in the cone, add coffee grounds, and then pour boiling water over the grounds. It instantly brews a cup of coffee directly into the mug. Throw away the filter, rinse out the cone, and viola, you’re done! Simplicity is a beautiful thing. So is life with real coffee, not instant. We’ve known for some time that our carbon monoxide/LP gas leak detector is highly sensitive to all kinds of odors and maybe even to weird air pressure changes. It gives us false alarms semi-frequently (as an aside, from what we’ve read online and witnessed ourselves in campgrounds, we’re not alone – this seems to be a common phenomenon in most RVs that come equipped with a hardwired detector). We’ve learned to turn off the alarm and to identify and remedy the trigger pretty quickly. It’s usually a simple fix, and we can usually avoid a second alarm. However, when the alarm sounds repeatedly at 4:00 a.m. while parked overnight at a busy truck stop where all the trucks have their engines idling all night so they can run their A/C, there is really no choice other than to evacuate immediately, even if that means searching for the nearest Wal-Mart at 4:30 a.m. in a strange town. Roadside wildlife sightings can create massive traffic jams and/or unsafe travel conditions, as people will unabashedly park their automobile in the middle of the roadway (major highways included) to open doors or to get out for photo ops. We’ve witnessed this inside and outside of national parks. It’s sad how few people take a real hike when they visit parks out west. But, if you do take a hike, it really is a good idea to carry bear spray and to know how to use it. It’s also wise to follow all other recommendations regarding hiking in “bear country”, including making noise while hiking so as to avoid startling a bear. From personal experience, singing loudly seems to be an effective deterrent. Really, does any creature want to be near our singing? It’s also sad (and surprising) how many people we see hiking completely unprepared. It’s not at all uncommon to see people on a 5-10 mile roundtrip hike with improper footwear, no daypack, no first-aid kit, and at best, one average-size bottle of water per person, even with children in tow. You know what they will have? A cell phone (with or without reception), camera, and/or selfie stick – you know, the essentials. Also, people commonly seem to have no concept of how long it takes to hike a mile; people often desperately ask, “Are we almost there? ?” two miles into a four-mile ascent, despite the rigors of the hike being advertised in advance. Public libraries are the best places for us to find fast, reliable wireless connectivity for posting pictures and blog updates. In addition to speedy connections that don’t crash, they often have big parking lots (a necessity when we have the trailer in tow), long hours of operation, and really nice indoor spaces. And, we don’t feel the pressure to purchase a thing – no overpriced coffee here!